Artist Maya Hayuk hard at work on her wall. While many Art Basel Miami Beach attendees wandered about the dense cluster of galleries indoors, something really remarkable was happening outside. 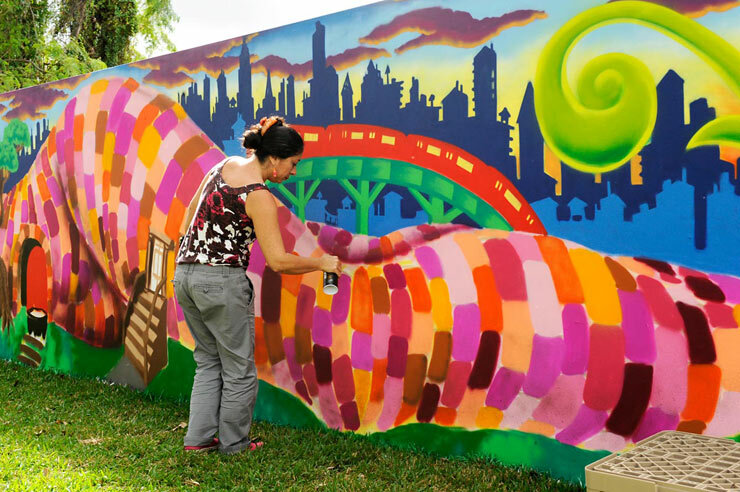 The Wynwood Walls hosted a slew of talented female graffiti and public arts artists, who brought dynamic color, vision, and creativity to the Wynwood District as part of Women on the Walls, a presentation co-curated by Jeffrey Deitch. The Wynwood Walls is a Miami district comprised of brilliantly painted murals and graffiti-covered warehouse walls. Formerly an abandoned area, the late visionary Tony Goldman saw the stark concrete walls as an enormous blank canvas, and soon Wynwood Walls was introduced. Since 2009, the Walls have attracted some of the greatest names in graffiti and public arts, as well as prolific photographer Martha Cooper, who has been instrumental in providing the Wynwood Walls with global exposure by documenting its artistic development. She is the Wynwood Walls’ official photographer, a fitting role for a woman with decades of experience photographing urban arts and culture. 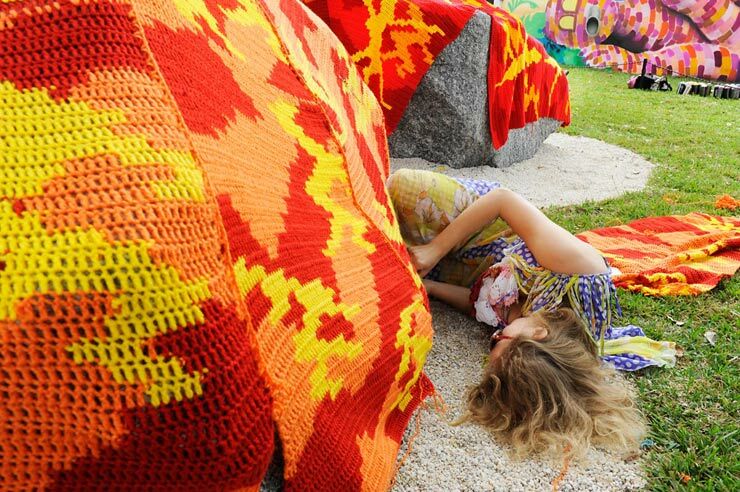 Artist Olek working on some massive yarn pieces. A legend in her own right, Cooper has influenced the graffiti and street art community immensely throughout her career by capturing incredible public art from all around the world. She has allowed for subversive and controversial graffiti works and public art to become accessible to anyone, and has inspired countless artists for decades. In 1984, Cooper published Subway Art, a groundbreaking look at the explosion of subway graffiti, and a narrative that shined a spotlight on this artistic genre and its place in greater contemporary arts discourse. Her photographs depict street art, hip-hop culture, and every day life in vibrant, beautiful clarity; she has made fringe arts and culture available to people who may never have explored it without her. At the Wynwood Walls, Cooper captures new work by artists from all over the world. Her photographs serve as a visual timeline of Goldman’s vision, and showcase the incredible talent that touches these warehouse walls each year. Lady Pink working on her mural. 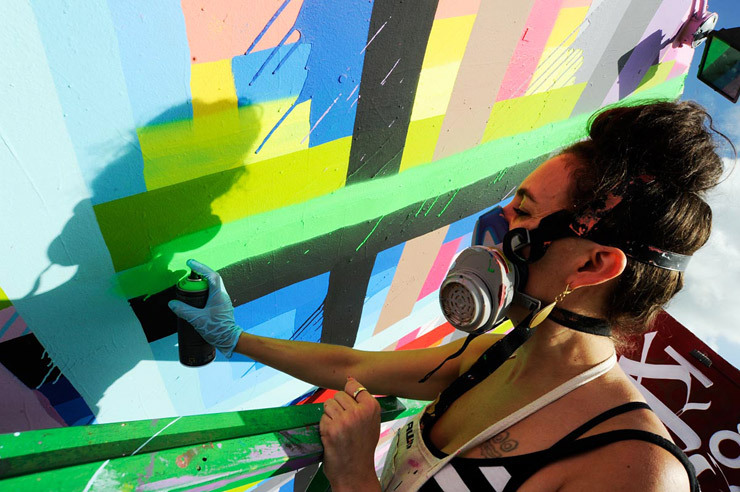 Earlier this month, Cooper documented the astounding new murals as they unfurled during the Women on the Walls presentation, a curated public arts demonstration that featured talent such as Miss Van, Maya Hayuk, Olek, Lady Pink, Sheryo, Fafi, and more. Female artists are often grossly underrepresented in the public arts realm, a reality that inspired the conceptualization of the project. Deitch discusses a want to “correct the historical imbalance,” by placing women at the forefront of the genre and showcasing the creativity of the public art community’s greatest talents. Tony Goldman once said, “Through paint, energy and creativity, you’re sending out electricity and imagery that elevates!” This was certainly the feeling that emanated from Women on the Wall. Go to Brooklyn Street Art to see even more images and to learn more about the artists and their work at Wynwood Walls.